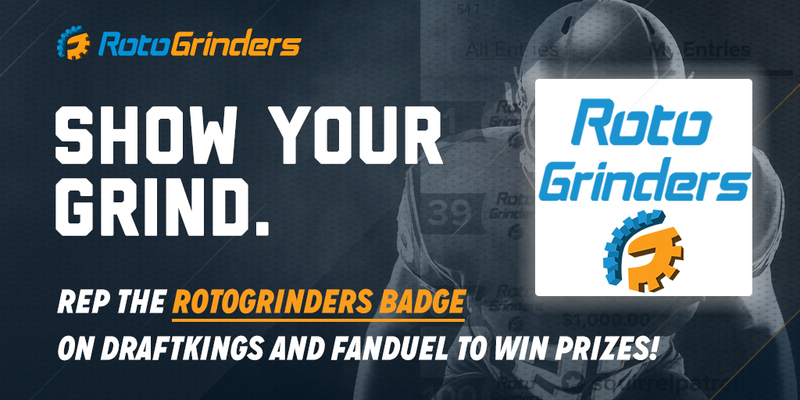 Wear the RotoGrinders Badge and get Free Premium Content! We wanted to offer a fun and ongoing promotion that will award FREE premium content to badge wearing users! Let's take a detailed look at the promotion. The promotion is very simple: Finish in the top 10 of a GPP (Guaranteed Prize Pool) contest with at least 5,000 entries while wearing "our badge" and you will receive FREE premium access for one month. 1. "Fill out this google form. ":https://goo.gl/forms/oJ9XhMEbYVbG9LFr2 (Everyone participating in this promo needs to fill out this form). 2. Download "our badge" and upload it to your DraftKings and/or FanDuel account. You can download the badge by simply Right-Clicking on it and selecting the "save as" option. 3. Finish in the top 10 of a GPP contest on either Draftkings or FanDuel that has at least 5,000 entries (at least 2 games and can't be a tie with more than 3 other users). 5. Receive ONE FREE MONTH of Premium access! (You will gain access to the site you finished in the top 10 on). Terms: A user may only win once per month. This offer begins 9/1/17 and all contests need to occur after this date. RotoGrinders also reserves the right to revoke premium access if you remove the badge from your profile. Terms are subject to change - we will be switching up the tourney requirements from time to time so be sure to check back in!